Long delays at the mill are tough on truck drivers. Close to 57.2 tons of technology comes rumbling down the road. Possibly more if it is a PBS truck. It is well understood that timber transport, depending on the distance from the mill, is one of the highest cost components of the forestry business. We also know that timber trucks have recently become engineering marvels, with super low tare masses and impressive technology for safety and efficiency. 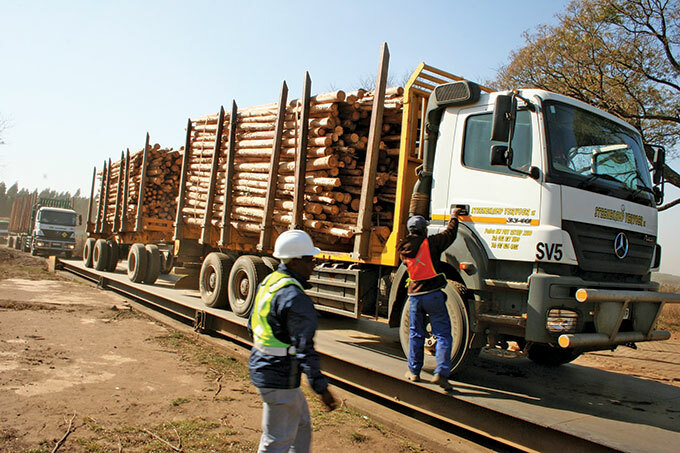 If the transport operator selects the correct truck according to conditions, it can lead to a cost-effective and reliable supply of timber to the forestry clients. However, this all falls apart if two key ingredients are not present. These are having a competent and well managed driver and having an acceptable road network. I recently accompanied a modern timber tuck on its daily routine of collecting timber and transporting it to a local mill, and pondered the factors influencing the success of the operation. The first aspect that struck me once the load was safely secured and all paperwork completed, was that even when the truck is suitably powered for the route, it takes some effort to reach the optimal speed for the road conditions. This is an obvious statement, but now let me qualify it. The plantation road we were travelling on was a B-class road, generally interpreted as being suitable for timber transport under the correct climatic conditions. This road would be deemed to be in pretty good condition if travelling on it in a pick-up or small truck. The road still had a general crowned camber. However, there were sections where the crown was slightly flattened and relatively minor potholes developed. Well, these small potholes may be okay for a pick-up to drive over, but the implications for the loaded truck are not the same. The truck had to come to virtual standstill for all of these sections, and then begin the process of picking up speed again. One could feel the stress on the truck if we went over these potholes a little too fast. The overall effect was a very slow travel speed on the plantation road, which could have been avoided through minor road repairs before timber transport operations. The lesson is that forest managers must take note that even minor road imperfections have a very large impact on loaded truck average speed, and they should not judge the condition of the road by how it feels when you drive over it in a pickup. Once on the asphalt road, the truck could maintain good average speeds depending on traffic conditions. Now to the driver. It again sounds like stating the obvious, but we really do need to ensure that we have competent and alert drivers if we are going to realise the advantages of the technologies in modern timber trucks, and maintain safety levels. The driver spends up to 12 hours behind the wheel in what can be a monotonous cycle of collecting and dropping off timber. Drivers need to be properly trained and regularly assessed to ensure continued performance. It is frightening listing to the radio and hearing about the number of truck accidents (of course most are not timber trucks). The driver that I accompanied was very experienced and displayed good defensive driving skills. He was constantly alert for changing conditions and other road users, who seem fearless in the face of a 56-ton wrecking machine as they weave in front of them and overtake on blind rises as if they are on some kind of suicide mission. 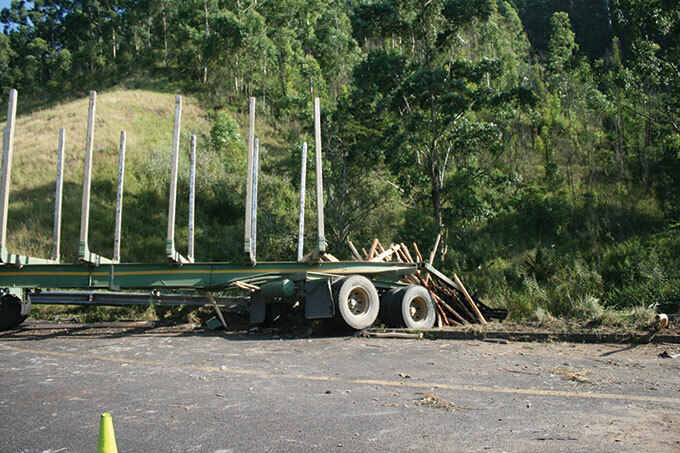 Another timber truck accident – this one on the N2 near Kokstad. Over the length of a shift, one aspect stood out which clearly frustrates drivers and contributes excessively towards fatigue. This is delays at the point of loading and offloading. Having to wait during loading and offloading is a psychological killer and wears down the most motivated driver. For example, the trucks are loaded within 30 minutes and offloaded within 15 minutes. But the terminal times are often in excess of 90 minutes – even if there is little queuing. We need to ensure that our fleet management limits queuing of trucks at the point of loading, and then we need to ensure that the paperwork process is streamlined to get the truck going from the landing/depot as quickly as possible. Mill management needs to pay better attention to their inefficiencies to make sure that the weighbridge to weighbridge process is better managed. If this is not improved, they are not only contributing to increased transport costs, but increasing the risk of a fatigued driver having an accident on our roads. I did similar studies with Harold Richardson (Productivity Management Services) back in the mid-90’s and found the same problems and these have still not been addressed? What’s the problem?